Jigsaw puzzles can be notoriously known for demanding patience and perseverance from their subjects. A lot of people have started putting together major jigsaw puzzles but have given up long before the project resembled anything like the finished product. If you feel you have what it takes, then give it a shot. You've got nothing to lose. There's no easy way to work on a jigsaw puzzle, but, for what they're worth, here are my strategies. For starters, ensure that you pick a jigsaw puzzle according to your level of experience. Obviously, if you've never carried out such a task before, it is recommended that you select anything between 50 and 250 pieces. Two thousand piece puzzles and more are for advanced gurus. Empty the contents and place them on an empty table. Find out what pieces form the perimeter. Usually the corners are the most difficult to find. Arrange all pieces into separate piles according to colour. 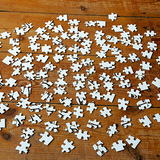 Many jigsaw puzzles tend to have splashes of specific colours in certain places. For example, if your puzzle is that of a tiger, you'll find that the majority of its pieces are dark yellow or varying shades of orange. Start with the perimeter and work your way in. You'll find that some parts of the puzzle are easier to fill than others. Try not to attempt the hardest sections of the puzzle first, thinking you could get them over and done with. It doesn't work that way. Do the easiest ones first; it's the only way to make the harder ones easier. Rely completely on the jigsaw puzzle's box picture for guidance. That is your only lead. And whatever you do, don't lose any pieces. There's nothing worse than a completed puzzle with gaps, especially if that means teeth are missing in a puzzle of a man.